ProEnc’s NL26 anti ligature TV enclosures are used In jails around the world, now securing the world’s largest correctional facility with their NL26 anti ligature TV enclosures. ProEnc’s NL26 anti-ligature tv enclosures are used in both psychiatric and jail environments, a recent project came up to supply the largest correctional facility in the world. ProEnc had been through the selection process after their enclosure had been tested to destruction, so the facility would know what abuse the housing would withstand. The NL26 is a surface mounted solution, however the facility needed 79 recessed enclosures, due to the cell size and having minimal intrusion into the inmates space. 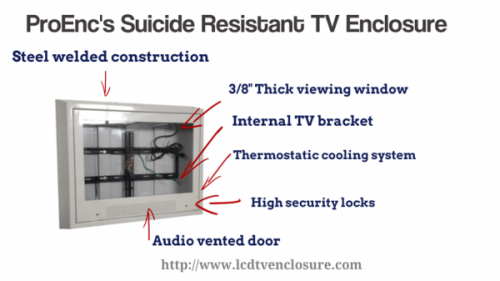 ProEnc’s NL26 jail grade TV enclosures. Small screens are the most popular in correctional facilities across the world; the facilities provide the inmates with flat screen televisions in the cells of the inmate’s cells. Correctional facilities rarely install flat screen televisions over 36″, hence the NL26 being the perfect size for these areas. With being responsive ProEnc are one of the very few US registered businesses that responds fast, with an expedited quotation system that guarantees a 24 hour turn around, now the recessed anti ligature enclosure is available on a short lead time.